1. It’s a gastronomic homerun that makes the most of leftover odds and ends while resulting in a dish worthy of multiple servings, rave reviews and a call home to Mom. 2. It’s a hot mess of a meal that results in me MacGyver’ing fried rice into “fried risotto” before arriving at the final (and only) destination for 4 cups of excessively sticky rice … Asian-inspired arancini. The key element in this equation is the moisture level. 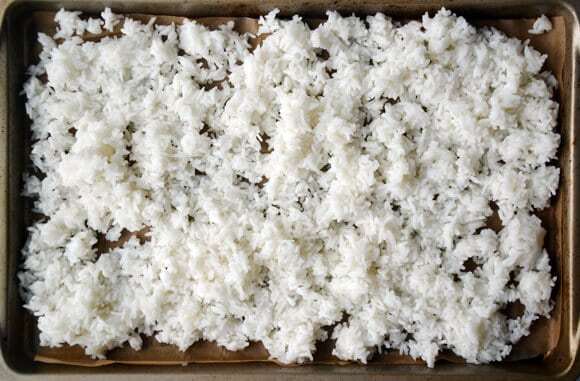 Hot, fresh rice sticks together, while older, cooler rice is less likely to cling to itself. 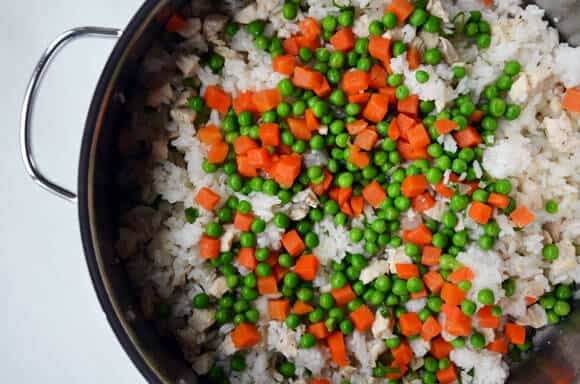 The good news is that even if you are starting out with fresh rice, you can speed up the drying out process by spreading it onto a baking sheet and stashing it in the fridge. And while you’re poking around in there, grab whatever stray tidbits are taking up shelf space. Peppers, onions, Brussels sprouts, pancetta, chorizo. All are welcome in this ultimate clean-out-the-fridge feast. 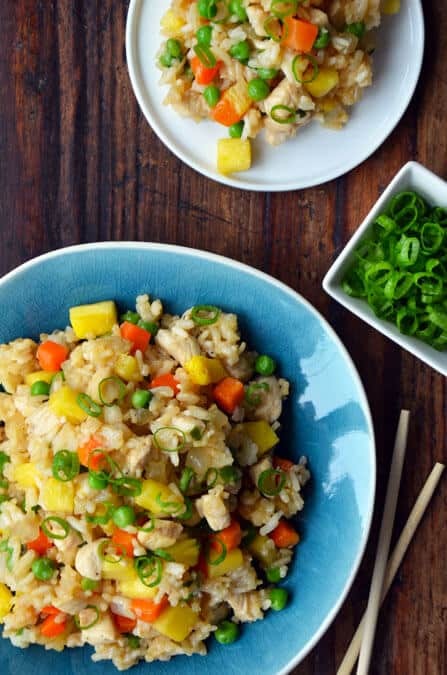 In a medium bowl, toss the cubed chicken with the sesame oil and season with salt and pepper. Heat a large sauté pan or wok over medium heat and add 1 tablespoon vegetable oil. Let the pan heat for 2 minutes then add the chicken and cook, stirring, until the chicken is cooked throughout. Add the remaining 1 tablespoon of vegetable oil then add the onion, garlic and ginger and cook, stirring occasionally, until the onion softens, about 2 minutes. Add the carrots and cook 1 more minute until they've softened slightly. 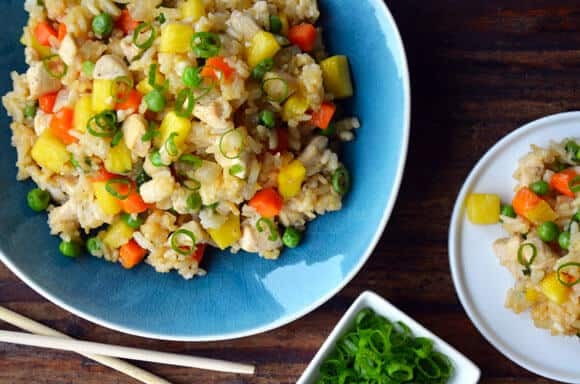 Stir in the scallions, rice, peas and chopped pineapple. Drizzle the rice with the soy sauce then stir to combine. Season the rice with salt and pepper and serve. Use a sauté pan that has at least a 2-inch rim so that all of the ingredients can be properly stirred without overflowing from the pan. 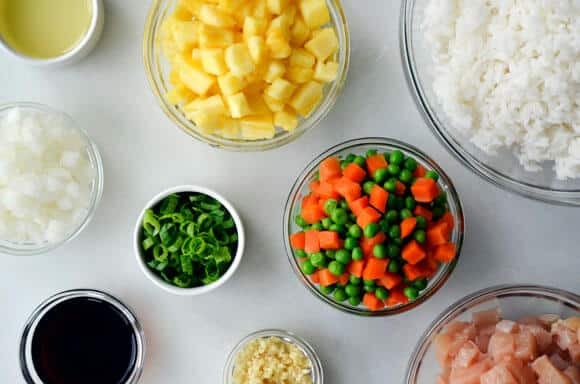 Put your knife skills to the test for true restaurant-quality fried rice, which features small diced pieces of protein, vegetables and pineapple. Smaller-sized ingredients guarantees a little bit of everything in each bite.